From the fertile mind of QRP Hall Of Fame Pete N6QW comes a new Radio Project, the Sudden QRP SSB Transceiver. If you have never Scratch Built such a Rig and would like to N6QW’s latest offering deserves close inspection. Using only readily available (and cheap) components (and few of them) one can build a Full Blown SSB Transceiver for either 40 or 20 meters. The Radio’s Design will be featured in 2 installments of GQRP’s Sprat Magazine. The 1st being in the Fall issue (Receiver/LO) and the second part with come in the Spring 2019 issue (Transmitter). One use for the Rig is on the Digital Modes, to that end he has design a simple Digital Adapter (which is also described on n6qw.com). One possibility is for a dedicated FT8 Transceiver! Even if you do not intend to build the Rig take a moment to check out his Web Page. There you will find a wealth of information on designing and building such Transceivers. Thanks for the tip, Pete! How exciting! This looks like an innovative little rig and I love the concept of only using accessible components–in the end, that will give this little rig some longevity. 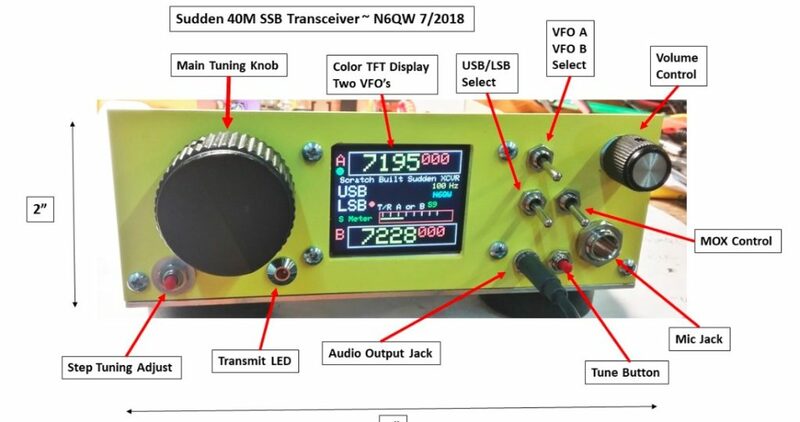 This entry was posted in News, Product Announcements, QRP, QRP Radios and tagged Kits, Pete (N6QW), Pete (WB9FLW), Sudden QRP SSB Transceiver. Bookmark the permalink. Just a correction to the GQRP Sprat information given – ‘part 2’ will appear sooner. It will be in the Winter Sprat and not the Spring issue as stated. We are always on the lookout for articles like this. Contact Tex G1TEX with submissions. Contact details on the club website.